My friend used to live on Bainbridge Island, so we decided to take a day trip over there. We were on a mission for licorice and yarn. Our first stop was a licorice spree at the Marina Market in Poulsbo—a cute and strange Norwegian town. 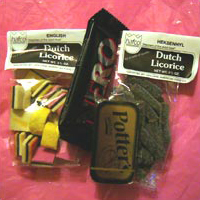 I honestly didn’t know there were that many different kinds of licorice produced; I guess they import a lot of it. I have never really liked licorice very much but after trying some of Zach’s I’m open to the possibility that I just don’t like bad licorice. He gave me this kind that looks like a piece of chalk and is coated with salt and then a hard candy shell. It was really good. My favorite part of the store was the freezer full of dead, bloody herring that were right next to the bags of crushed ice. 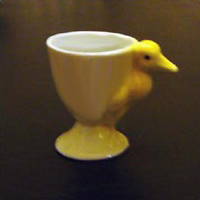 We then wandered down the street and I dragged Zach into an antique store to see if I could find another egg cup for my collection. I did and isn’t is cute? There wasn’t much else in the town that seemed interesting except for the Marine Science Center. It was a teeny little place, but they had nice displays and touch tanks so we decided to go in. Zach didn’t want to touch anything so I made up for him and touched everything twice. Although, I did make him touch the sea anemone because it was so weird and sticky. I kept looking at the giant sea scallops wondering if they are still tender when they’re that big. More and more I find that when I’m looking at animals I’m picturing them on a dinner plate with an accompanying sauce. Sometimes, when I look at my cat, he runs away. It was fortuitous that we went to the science center, because if we hadn’t, we would have completely missed The British Market. They actually had real, imported HP sauce (we did a taste-test a while back between HP sauce that was brought from London by a friend and HP sauce from DeLaurenti’s—they are drastically different and the real stuff is much better). We got the HP sauce and some Hob Nobs. They also had a freezer stocked with Pork Bangers, Bubble & Squeak and British Back Bacon, but sadly we had no way to transport frozen meats. We got back in the car and drove to Winslow to check out Churchmouse Yarns & Teas. I had been used to shopping for yarn at places like Jo-Ann fabrics, so I was impressed and had to touch everything… Twice. I ended up with some really beautiful and soft balls of yarn. We needed a snack, so we stopped in the Blackbird Bakery. I had to try the pots de crème—I love anything that requires its own specialty cookware or dish. And of course milky, gooey caramel doesn’t hurt either. After dessert, we decided we needed dinner, so we walked down to the marina and stopped at Doc’s Marina Grill. We ordered a great gorgonzola bacon burger and a prime rib dip with cheddar cheese on sourdough—possibly the greasiest sandwich I’ve ever eaten, but it was incredibly good. The beef was delicious and the waiter told us it was from Misty Isle Farms. The burger boasted some of the best applewood smoked bacon I’ve ever tasted, also from Misty Isle. The waiter said that the farm produces a limited number of pigs (and only in the summertime), so it may be hard to locate bacon available to the public. But I will try. I would suggest JW Desserts (360.341.4302) which is in Clinton near the ferry. It’s in “Ken’s Korner Mall” near Les Schwab… but don’t let that scare you off. Their cakes are exceptional!